St Wilfrid (634 AD to 709 AD) is reputed to have undertaken baptisms in this area beside the River Trent near where St Wilfrid’s Church now stands. Some Saxon remains have been built into the fabric of the church, eg in the porch. 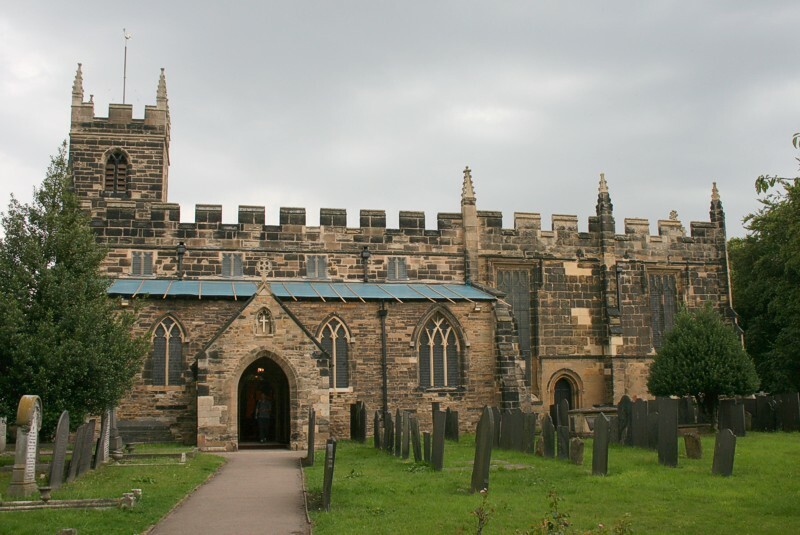 The building consists of a battlemented nave and chancel, north and south aisles and north porch, vestry and small tower with battlements, four pinnacles, and five bells at the south east corner. A piscina ornamented with sunken star and cable mouldings indicates Norman origin. This piscina served an altar dedicated to St Katherine. Grave covers of the 12th to 16th centuries pave the floor of the east end of the south aisle. A pig-like carving near the ridge of the south aisle roof is thought to be 900 years old. There is a pre-Reformation stoup and a three-seat sedilia. The font may be 14th century. There are three scratch sundials on the south wall of the chancel. The church had to be re-built after severe flooding in 1346 with an enlarged nave and inclusion of north and south aisles, though the chancel was neglected. The present chancel was built c1430 with a much lower pitch to the roof. (The south wall had been pushed out of perpendicular.) A clerestory added in the 15th century, as was the tower. At the end of the 17th century deal wainscotting was fitted around the chancel and musicians’ gallery at the west end of the nave. (It was removed in 1871). The Royal Coat of Arms of George I can be found under the tower. A Father Willis organ was provided in 1878. The rood loft is still indicated by a newel staircase. The loft is long gone but the chancel screen was replaced in 1890, when the church was restored by Naylor & Sale of Derby. In 1939 a new oak reredos, retable, panelling and bishop’s chair were dedicated. There is a memorial window by O’Connor in glaring colours to the local poet Henry Kirke White, who wrote the hymn Oft in danger, oft in woe. In the churchyard is a brick octagonal gazebo (1757) used by Kirke White for writing poetry, and as a mortuary. There is also a magnificent slate headstone by F Radcliffe, a Nottingham woodcarver.